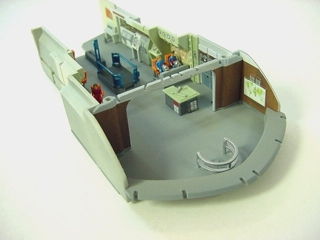 Forget painting the intricate interior of the Moebius Models Seaview. Completely new artwork has been designed to fit precisely in the stock interior so these decals enhance every button, console, and display screen. Our strive for accuracy and realism is exemplified in our choice of colors: Set-accurate, muted colors provide fantastic realism rather than a cartoon-like style of garish colors and exagerated shadowing. Printed by JT Graphics, and including easy-to-follow instructions and placement guide, creating an exquisite interior for this fantastic kit has never been easier. For an even better looking interior, pair these decals up with our Photoetch Enhancment Set (link below) for the ultimate interior! Note that the images on this page incorporate only a quick spray of white paint. All other color comes from the decals! True metalic inks add extra realism to the bare metal details of the control room. Buildup and photographs courtesy of Randy "Voodoo FX" Neubert.